The Lord spoke to the Pharisees with this verse. 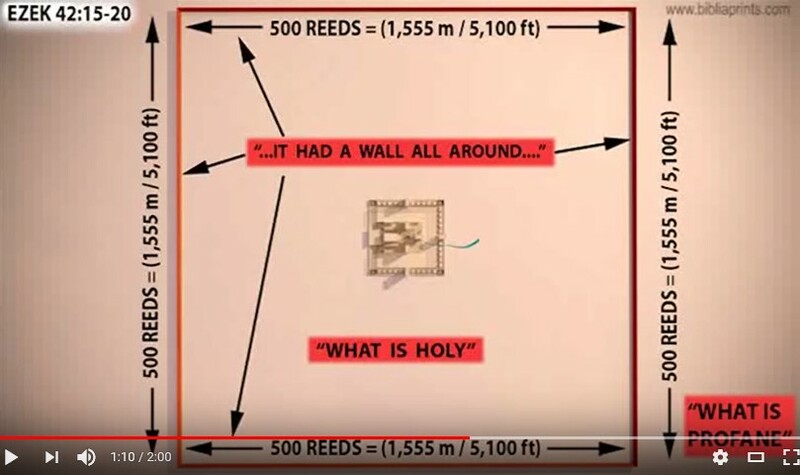 My brothers and sisters, I am beginning to believe more and more that the Prophecy of Gwendolen Song about the Virtual 3rd Temple could indeed be from the Lord. The way in which she has built her speech with images and comparisons makes one think. Convince yourself with seeing this video! The moment the false Prophet will reveal himself, the building still has to get started. 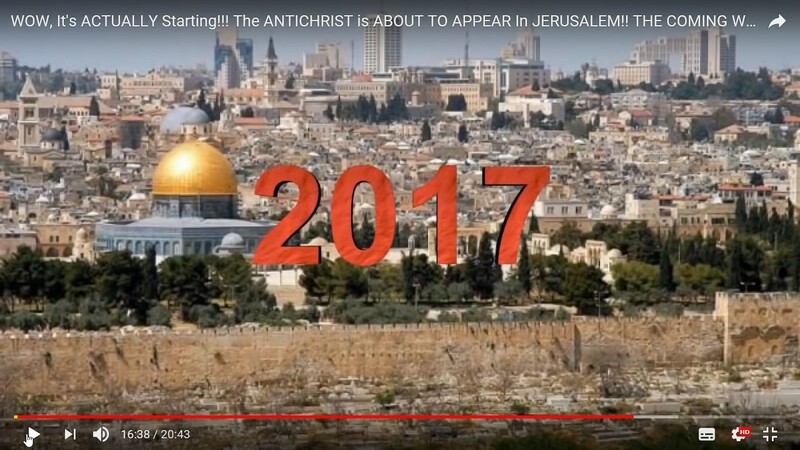 If the Rabbi’s expect their Messiah at the latest in Nov./Dec.2017 and the Rapture would take place in Aug.2018, the Third Temple can never be completely finished before that time. The false Prophet shall probably not be known until March 2018. That is five months before the Rapture before he will be fatally injured in Aug.2018 (Rev.13:3-4a). That is why I think that the Virtual 3rd Temple may still be true, something no one could have thought of, or it must have been passed on in a Prophecy by Jesus Himself. These verses indicate that the false Prophet will enter and initiate the Third Temple. However… if the Prophecy of the virtual Temple is true, then the Temple shall possibly not be built. What I had already thought impossible at first in March 2018, the Temple cannot be ready for Aug.2018 either, in such a short time. 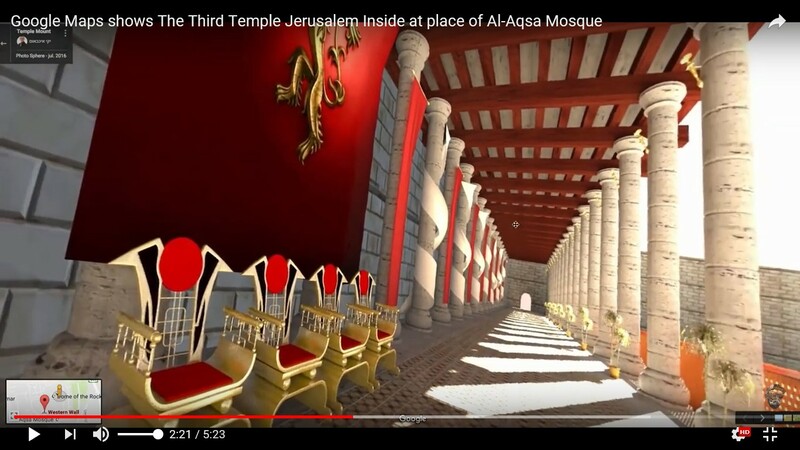 With the hearing of this YouTube video, about this Virtual Third Temple, suddenly an answer has come that I could not have imagined and probably many Christians with me. 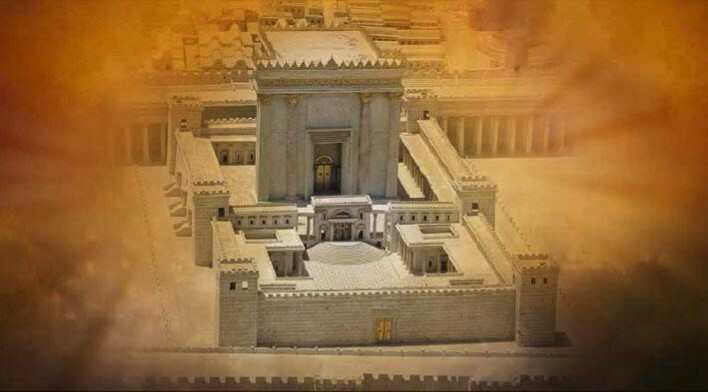 The construction of the Third Temple takes ±12 months. Because the time of Aug.2018 again does not correspond with the 12 months needed for construction, I started fasting again. After two days of total fast, the Lord had me open a YouTube video of Gwendolen Song, on Sunday evening Nov. 12th, 2017, who had received a Prophecy from the Lord about the Virtual Third Temple. I have seen and studied this video more than 10 times. If you hear the report as such, it could be the only reason why the construction of the Temple has not started yet. The Jewish people are looking forward to the Messiah, because his presence is the signal for building this Third Temple. In addition, all holy means meant for the Third Temple are ready. I believe that these objects shall be preserved for the fourth(?) Temple in the 1000-year millennium. Should there be either a Third Temple or not on Mount Moriah (Temple Mount), then the fourth Temple of Ezekiel shall be built in the Valley of the Mount of Olives. However… if there is no Third Temple to come then this fourth Temple is actually the Third Temple. As soon as the Messiah has revealed himself, the Rabbi’s will soon realize, that this cannot possibly be the man who the Jewish people and the Rabbi’s had expected. It may take several weeks before they realize that, because the Jewish people are overwhelmed with joy. Although it is likely that all preparations for the construction will be started immediately, the Rabbi’s could, on closer inspection, postpone this project for an indefinite period of time. 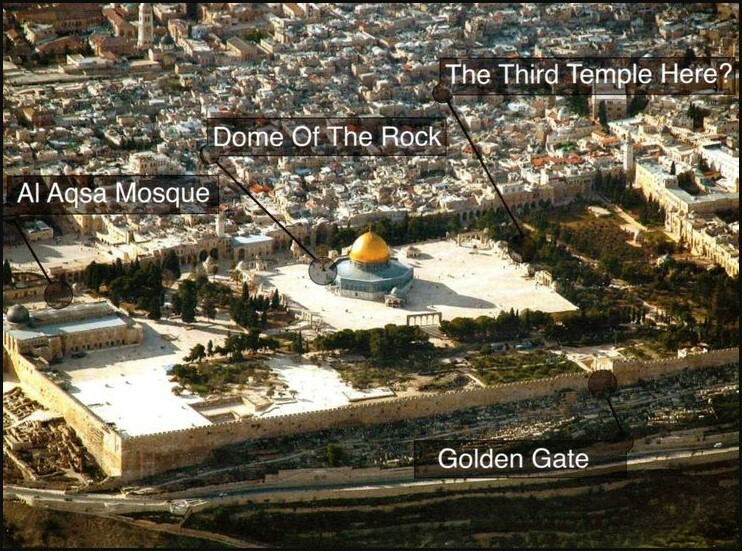 Is this possible, the Third Temple next to the Dome of the Rock? 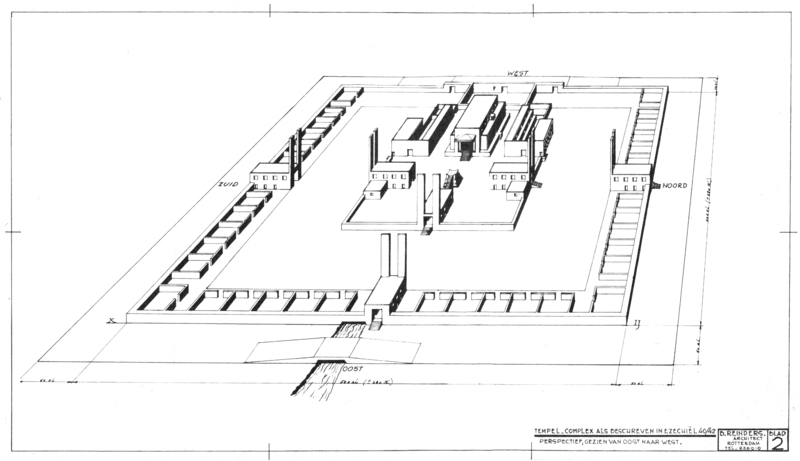 The construction of the Third Temple? 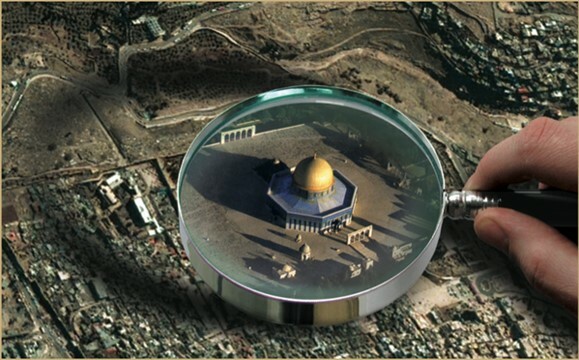 It is almost certain that the Dome of the Rock will not be demolished. They could build the Third Temple next to it, because measurements have already been taken. All natural stones have already been formed for setting up the Temple and everything that has to do with the Third Temple, both inside and outside, has already been made and stored. The coming of the Messiah is the signal that the construction of the Temple can begin. The waiting is still on the Messiah. The false Prophet will not take place in the Third Temple, for he shall be expelled from Israel before time! Jesus will also not use it, because He goes for the fourth Temple. This Temple shall be built in the Valley of the Mount of Olives. There is a source with running water. 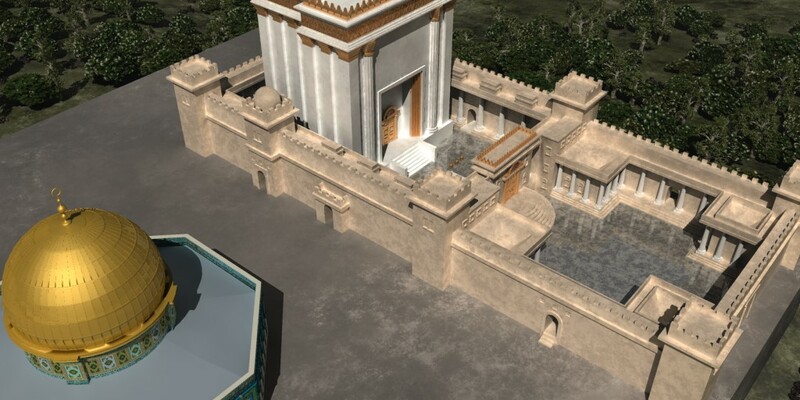 Because in no way the construction of the Third Temple has begun yet, there might be some doubt among the Christians whether the ‘Third Temple’ will or will not come. However, perhaps this fact must be seen as a spiritual Temple hidden in the hearts of Christians. In the Tabernacle, in fact, the Spirit of God the Father dwells. The Tabernacle was once a tent with which all of this began and with the first Temple, it has received a permanent place on Mount Moriah in the City of Jerusalem, the heart of Israel. Spiritually speaking, Jerusalem is the Capital of the world. If we see this as such, then Christians actually also have a Temple. That is, the body in which the Holy Spirit lives could therefor be the Temple of God. With this fact it is not exactly inconceivable that the Third Temple will probably not come. Yet… there are some verses in the Bible that the worship service is being interrupted in the End Times. That means that the sacrificial service will restore in these End Times. Out of the 70 weeks of Daniel, this verse concerns the last Week that has two periods of time. The first period of 3,5 years is before the false Peace and the second period of 3,5 years concerns Armageddon. The sacrifice and offering will stop at the end of the first 3,5 years. The Jews and the Rabbi’s still assume that the construction of the Third Temple will actually start very soon. On YouTube you can find many videos about how this Temple will look like. As long as the problems remain, that the construction of the real Temple will probably produce, it is possible to use ‘Virtual Reality’ and internet to make a simulation of the Temple with its rooms and sanctuaries. 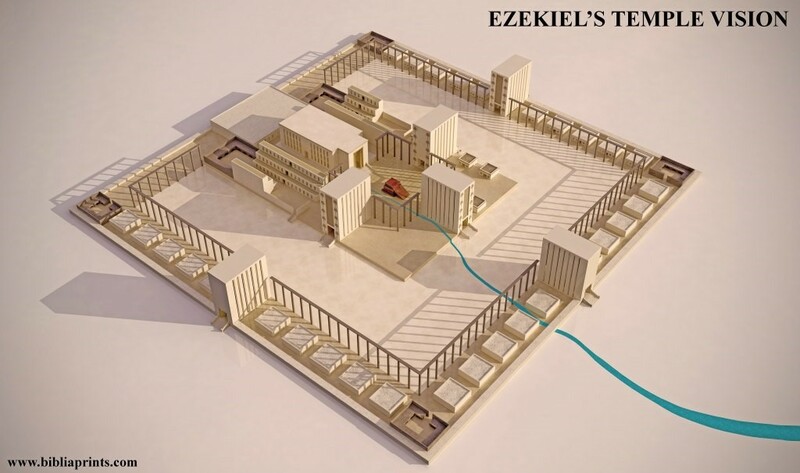 A similar perspective of the Temple proposed by Ezekiel, as described in Ezekiel 40-42, given as literally as possible. Circumference 280 x 280 meters. The future fourth Temple will be larger than the first and the second Temple. It is compared to the vision of Ezekiel that the area of the fourth Temple, in the 1000-year Kingdom will be 36 times the size of the second Temple. Its circumference will be a gigantic surface in a square of about 1,6 x 1,6 km! See the area around the Fourth Temple of 1,6 x 1,6 km! The Fourth Temple of Ezekiel is indicated above the Dome of the Rock. The size of the square is 1,440 Km square in this drawing. It also says that all old buildings should give way to the construction of this Temple. Well… that will not happen, because the fourth and last Temple will be built in the Valley of the Mount of Olives. 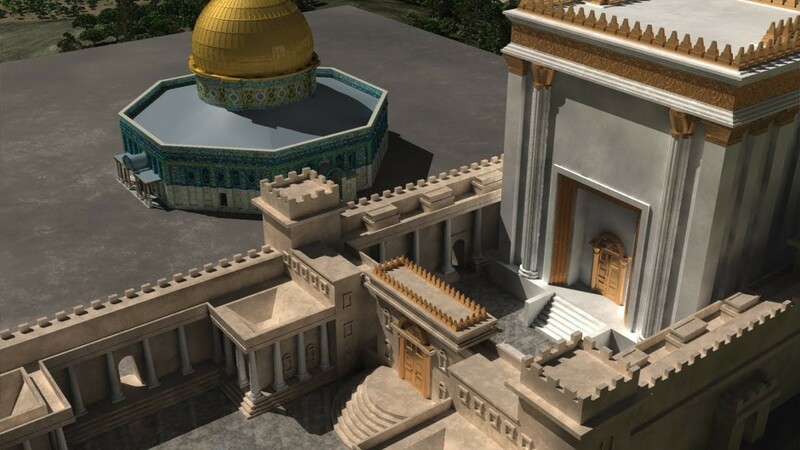 Jesus will never allow the fourth Temple to be built on Mount Moriah, for the Dome of the Rock has in fact occupied the entire square and represents a different faith. 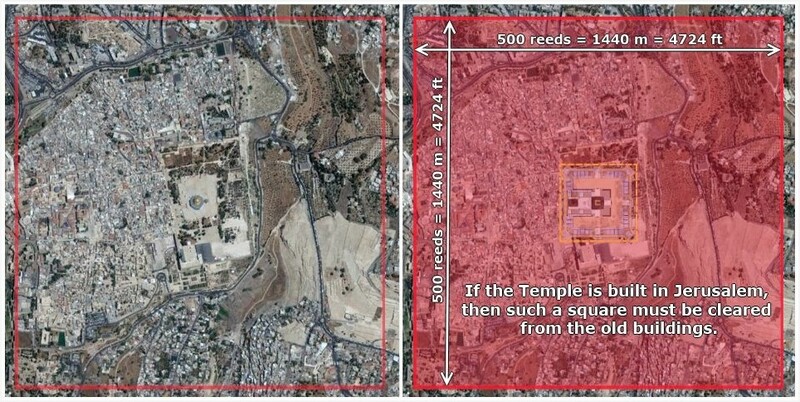 This drawing shows how large the area around the fourth Temple of Jesus will be. The measurements sometimes differ, because the old measurement of that time was used to describe the whole. Yet with the first calculation of 1,609 Km, this 1,555 Km square is still quite large. How big it will eventually become, in the 1000-year Kingdom of Peace, will be determined by Jesus Himself. See calculation. There used to be many types of measurements. According to the drawing of the Dutch architect Bartelmeüs Reinders, the outer circumference of the square shall be with 4 x 500 cubits each 280 meters and with that data he has drawn the fourth Temple to scale. However… if I hold on to the “Amsterdam el” (Amsterdam cubit) of 68 cm, I will end up with 320 meters! Either way, the fourth Temple of Ezekiel is a huge complex that may take many years to complete, because immediately after Armageddon there are hardly any people to be found on the Earth. This verse shows the beginning of the 1000-year Peace Kingdom. You can hardly see it. According to my calculation and that of the writer and Evangelist Hal Lindsey, out of the ±7,7 billion, just over 50 million people will remain in the world after Armageddon. With the Rapture, just over one billion people will be taken and the remainder (±6,7 billion) is dead. Initially I had calculated 300 million, but ultimately did not come to more than ±50 million people. The ideas of the Rabbi’s not to let the construction go on will strike like a lightning and bring the Jewish people into great confusion. Because after this miss the rabbi’s, by world opinion, are quite embarrassed. How could they ever have been so wrong? When it turns out that, after a very short time, this man (the false Prophet) becomes the absolute world leader, subsequently some doubt may arise among the Jews. The Rabbi’s did not want to accept him and now this man is going to make the world prosperous. The false Prophet is already present. The Lord has, in many prophecies, pointed out to Christians about the birth of this Antichrist, who was born on February 5th, 1962. This “Superhuman” will become visible to the world only after the mystery of Sept. 23rd, 2017! The same also happened with Jesus, who, after His birth, was only recognized by the people 30 years later as the Son of God the Father. The angels have made the birth of Jesus known to men (Luke 2:9-11). Satan however did not or hardly announced the birth of the Antichrist; that is what the Lord has had to do, warn the people of this danger! The moment the false Prophet will make himself known in March 2018, many people and Christians in name, will become confused, because this man is truly unbelievable! The false Prophet is not yet known. Besides the Lord has already considerably shortened the time (3,5 years) of the false Prophet with more than three years! (To be precise: 3 years and one month) This has to do with the fact that practically the whole world will support this World Leader. Because Jesus said about this false Prophet: “Even the Christians will think it is Me.” This man will be that wonderful and convincing. The false Prophet will rule for five months and then the Antichrist takes over! The false Prophet brings life and happiness! The horsemen on the red, black and pale horses represent the horrors of Armageddon. However the false Prophet has a spiritual force and, in this chaotic world, will really come with amazing solutions that people have not thought of before. His ideas will be brilliant. He is the absolute World leader! The false Prophet will bring peace all over the world and he will be able to solve all the problems that people face, such as the environment, housing shortage, poverty and hunger. He will be able to solve all the deadly diseases in medicine and he will also provide enormous employment, social and economic progress like the world has not yet experienced. Needless to say that the Jews and the whole world will see the Messiah in this man, an unprecedented world leader. Aerial view of the Dome of the Rock. (2017) WOW, It’s ACTUALLY Starting! 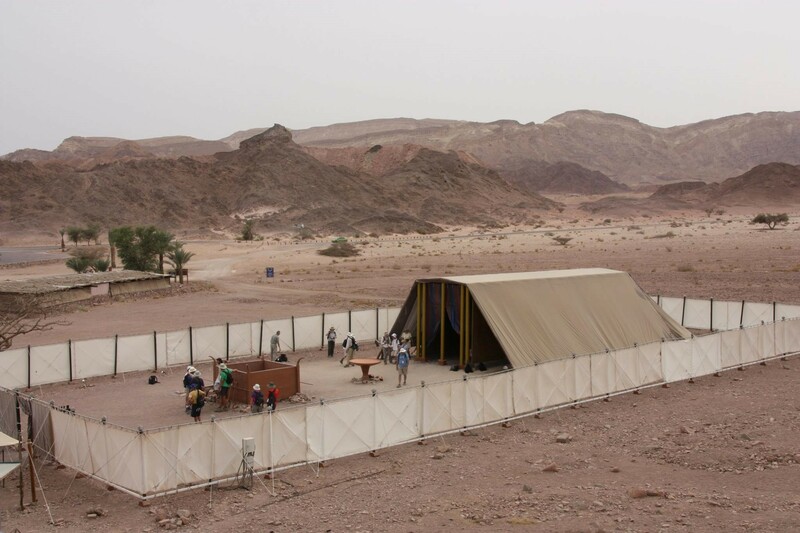 The Mishkan (Tabernacle)Life-size Tabernacle replica at Timna. Photo by Anja Noordam. The Fourth Temple seen from above. 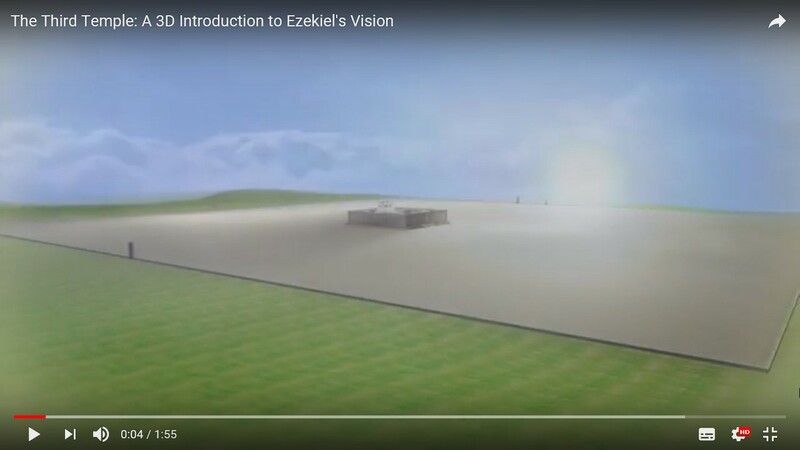 Ezekiel’s Temple vision. The Fourth Temple of Ezekiel (2) is not on this website. The Fourth Temple in the Valley of Mount of Olives. End of dream. 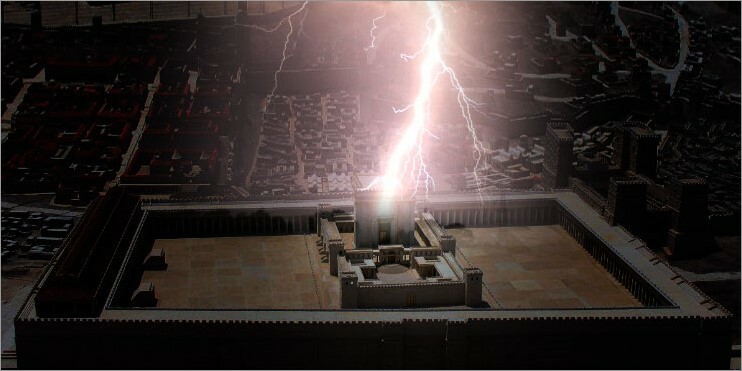 Lightning in the Third Temple.